I've taken pictures and reviewed other versions of this record in the past, so I'm not going to get too bogged down with describing the music. All that really needs to be known is that these are some of my very favorite Dan Sartain songs. They're early recordings of his and he originally released this the first version of this LP himself. Several of the songs were picked up and put on his first Swami CD, Vs. The Serpientes. Others were latter compiled onto the Sartain Family Legacy CD compilation, but this is how they originally were meant to be heard. I'm not entirely positive of the circumstances on how this 2nd reissue came about. It has completely different artwork than the original or even the prior Cass reissue. It's housed in a plain black sleeve with a white piece of paper glued to the front. 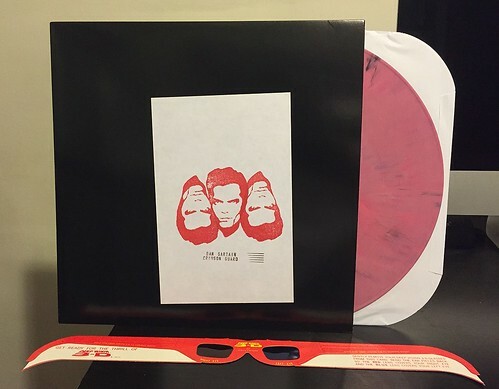 It's on pink vinyl this time (Though I think it was actually pressed on mixed colored vinyl, so there could be a lot of different versions out there). Lastly, like the original, it comes with a pair of 3D glasses, though this version doesn't have anything in 3D to look at with them. You should go buy this record. It's just one of my favorites and if the fact that this is the 3rd version of this LP I've added to my collection doesn't show how much I like this album, I'm not sure what else I could say to reinforce that. Last check Dan was still selling these on his Bandcamp page. Damn! I missed out. I can never get my hands on his vinyls. I'll have to hunt down this one ASAP.